The left, under the cover of the mainstream media, refuses to admit Barack Obama's socialistic leanings. The truth is undeniable. 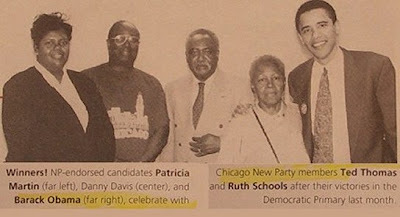 Barack Obama sought and received the endorsement of the Socialistic/Marxist New Party when he ran for his 1996 Illinois state senate run. Some publications listed Obama as a New Party member. Who was the New Party? Co-founded in 1992 by Daniel Cantor (a former staffer for Jesse Jackson's 1988 presidential campaign) and Joel Rogers (a sociology and law professor at the University of Wisconsin-Madison), the New Party was a Marxist political coalition whose objective was to endorse and elect leftist public officials -- most often Democrats. The New Party's short-term objective was to move the Democratic Party leftward, thereby setting the stage for the eventual rise of new Marxist third party. Most New Party members hailed from the Democratic Socialists of America and the militant organization ACORN. The party's Chicago chapter also included a large contingent from the Committees of Correspondence, a Marxist coalition of former Maoists, Trotskyists, and Communist Party USA members. Though Illinois was not one of the states that permitted electoral fusion, in 1995 Barack Obama nonetheless sought the New Party's endorsement for his 1996 state senate run. He was successful in obtaining that endorsement, and he used a number of New Party volunteers as campaign workers. By 1996, Obama had become a member of the New Party. In 1996, three of the four candidates endorsed by the New Party won their electoral primaries. The three victors included Barack Obama (in the 13th State Senate District), Danny Davis (in the 7th Congressional District), and Patricia Martin, who won the race for Judge in the 7th Subcircuit Court. All four candidates attended an April 11, 1996 New Party membership meeting to express their gratitude for the party's support. Amazing at how successful they have been in such a short time. Where is Joe McCarthy when you needed him? I am tracking Obama's relationships with a variety of shady characters (oops, now I need a food taster). If anyone has any solid information linking Obama to Larry Bland and Donald Young, probably through Trinity United Church of Christ, tweet me at DrKC4. Thanks. Keep looking. Even the birthers are starting to get traction. It's hard to be ignored when you disrupt a Congressional town meeting. And there is a lot more evidence that the Prez is a secret communist than a secret Kenyan. It's amazing that none of the things we already knew about him stopped the voters from electing him. No other candidate in history has emerged unscathed from so many scandals. What will it take to wake us all up? A drive to repeal the 22nd amendment? Or the Second? In other news, does anyone know how to put a twitter or facebook button on a blogger page? Thanks. "Gimme, gimme gimme," is all the useful idiots know. The Commie lib Socialists like this and take it up to promote their agenda.